A great introduction to baseball for 6-9 year old boys and girls! T-Ball is designed to introduce kids to baseball who are still developing and learning the fundamentals of hitting, throwing and catching in a fun and supportive environment. All players get equal playing time and coaches work with the kids to teach fundamentals and introductory rules. 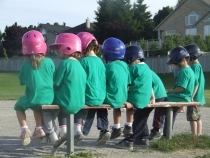 In this program we focus on fun, friendship, teamwork and sportsmanship. We strive to create an environment that gets parents involved. T-Ball has proven to be a natural transition into standard baseball, Rookie ball, and softball. It develops primary skills of hitting, running, fielding, and throwing. Players also learn fundamental rules of the game. As such, T-Ball provides a steady supply of young players equipped with the basic skills needed to play more advanced versions of the sport. There is no pitcher in T-Ball, which allows children to participate without the fear of being hit by a ball thrown at them. Members of two teams take turns hitting a ball from a batting tee set on home plate. Batters run between bases, trying to advance to home plate. Fielders catch the ball and return it to base, or tag runners to get them "out".